Complicated Technology, or Spending Thousands of Dollars! I've worked with hundreds of clients that felt just like you. Each of them was pregnant with an amazing idea for their very own card deck, but they simply didn't know how to birth it. As time passed their desire to help others with their deck only grew stronger. However, they felt totally clueless when it came to manifesting their dream. Many had almost given up hope that it would ever become a reality. So, they kept doing what they'd always done and an inner dissatisfaction lingered. Like you, they were driven by an intense desire to help others. If this resonates with you, then you are in the right place at the exact right moment. This is the SHIFT that you need for your LIFE and INCOME. You're ready for a better way. Having your own card deck allows you to attract and manifest more prosperity with ease and grace. Having your own card deck changes everything! More visibility...impact more lives...raise your vibration. What if I could show you how to create your own card deck yourself without having to purchase hundreds of decks upfront, find free images, infuse your deck with prosperity energy, and make sales without needing your own website, would you be interested? If this speaks to your heart in this present moment and you're truly passionate about fulfilling your soul's purpose, then all is indeed in divine order. This is your first inspired action step to create a major positive shift in your spiritual journey as a healer. The AMAZING NEWS is that there is an easy and proven way to create your own card deck and serve boldly so that you can make a very comfortable living - and be truly abundant - doing what you love without being overwhelmed by financial burdens for the rest of your life. I'm so honored that you were guided here. Today can open many doors of opportunity for you. I'm inviting you to join me for a brand new, comprehensive training - the only card deck creation training in the world that's designed specifically for healers, messengers, card readers, and spiritual entrepreneurs - ready to share their gifts, be the change, monetize, heal others, and spread love. It's called Charge Your Worth! Create Your Own Card Deck. Inside Charge Your Worth! Create Your Own Card Deck, I'll walk you through the exact steps that I took to create my own card decks and decks for my clients. Having my own card decks allowed me to not only become a full-time entrepreneur as a single mom, but also to dramatically elevate my visibility online and FULLY step into my calling as a healer. These are the same strategies that I normally charge thousands for product creation to my private clients, but now I've been guided to share them with you. This is a fantastic opportunity for those who are ready for their next level of awesomeness. I believe that your unique gifts and talents should be shared freely, but not for free (all the time). You deserve to be compensated well for your healing powers. Prosperity is your divine birthright. Source gave you, and only you, those gifts so that you can experience true abundance as you assist others. Simply put, the more income that you have, then the greater the impact you can make. What's occurring in the world has never happened before. You are here on the planet for such a time as this and mankind desperately needs your help. You are enough just as you are. You were created for this. You can become a wealthy healer right now simply by sharing the divine wisdom that is already inside of you. It's always been there. You just need to learn how to package it, share it in a bigger way, and monetize it. When you monetize your natural gifts and talents, you can give more and serve more. That is why you're here after all - to serve. Ultimately - Creating your very own card deck makes it easier for the people that need you to find you. It enables you to serve consciously without trading your time and energy for dollars. It's time for you to be a living example of infinite abundance. Allow me to show you how to fully open the doors for all of the blessings and opportunities that the universe has for you. Product creation is one of the only practical tools that I know of that will enable you to do what you love and get paid well to do it, with the smallest amount of effort, while having the greatest amount of impact. Allow me to share a little about myself and my unique gifts for teaching you how to transform your spiritual gifts into digital and physical products. I started my first business at the age of 8. I embellished iron-on designs and sold the t-shirts. I've always been an entrepreneur. Some may call me a serial entrepreneur. Even while working in corporate I ran my own business. I achieved great success, but I was still trading my time for dollars. I was always working and had stopped enjoying the little things. If I didn't work on my business, then I didn't eat. Without realizing it, I let my business become a J-O-B, even though I loved what I was doing. So, the decision to walk away from corporate for good was easy when my position was eliminated. I could have stayed. I had the option to accept another position that I knew would have drained my spirit and disrupted my family life. I left with the vision of growing my empire, not a business like I'd done in the past. I wanted to be able to enjoy time with my young son, work from anywhere, and help others. The choice to leave was scary because it forced me out of my comfort zone. I couldn't let fear be a factor. I was determined to live the life I wanted - one without any limits. I'm a full-time entrepreneur, work from home, travel the world, and walk in my purpose. I've even been fortunate enough to home-school my son, all as a solo-parent. I know for sure that digital and physical product creation has been the secret sauce for bliss. I couldn't have achieved the international success I have without first monetizing my knowledge through books, e-courses, and mp3s. The road of entrepreneurship hasn't been all sunshine and roses. I always say that being an entrepreneur is one of THE most intense spiritual journeys that a person can ever embark on. Only a few are chosen for this very reason. Every season will not be a harvest season - especially when you're first starting out. I've helped hundreds of entrepreneurs to create their own product line so that abundance can flow to them in unexpected ways no matter what season of life they're in. My most unique gift is that I'm able to bridge the gap between spirituality and entrepreneurship. I am The Authority that conscious entrepreneurs depend on to help them transform their services into digital and physical products. Like me, these changemakers understand that products allow them to expand their movements, build generational wealth, and positively impact the world. Inspirational card decks, online courses, journals, and planners allow you to help the masses without trading time for dollars. I empower you to build an empire instead of a business. I am an international speaker, bestselling author, and empire strategist. All of my services, programs, and products are infused with infinite love. Who's this virtual training for? This virtual training was created especially for healers, lightworkers, angel card readers, tarot card readers, astrologers, messengers, heart-centered entrepreneurs, and spiritual entrepreneurs that have been guided to create their very own card deck to serve others. I'm just getting started as a spiritual entrepreneur, will this virtual training work for me? Absolutely! The number one regret of many entrepreneurs is that they wish they'd created their own products sooner. Having a product to offer helps to generate much needed cash flow especially in the startup phase. Your own product also allows you to have counter-offer when people aren't quite ready to work with you one-on-one yet. When does the virtual training start & finish? The virtual training is self-paced so you can begin and end anytime you like. It's delivered online so you can access it 24/7 and fit it into your schedule. How long do I have to access the virtual training? You have life-long access! The best part is that you'll receive any updates at absolutely no-cost. Let me first point out that asking for help is a sign of strength, not weakness. Should you need help along the way, then you can post a question in our private forum at any time to get assistance from your peers and myself. 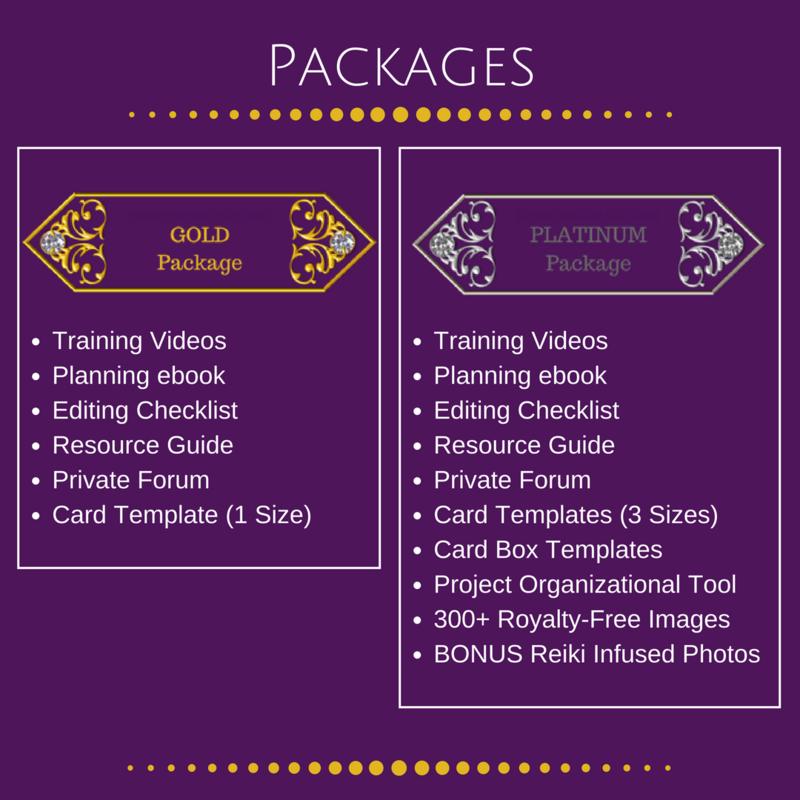 Also, you can upgrade to the Platinum Package where you'll receive a private 15-minute Brainstorm Session valued at $125 with me! During this time I'll happily answer any questions that you have. How is this virtual training different from others online? Great question! This virtual training actually sets you up to successfully execute your vision. Not only do you literally get to look over my shoulder as I create a card deck, but you'll also receive supplemental training materials designed to help you start and finish your project. Other online programs leave you to fend for yourself. I've discovered over the years that entrepreneurs, especially lightworkers like yourself, struggle with the implementation aspect. I'm geniunely committed to helping you fulfill your purpose. That's why this virtual training is a unique combination of Education + Implementation that cannot be found anywhere else in the world. What if I'm unhappy with the virtual training? The emotions that are coming up are likely forms of resistance about fully stepping into your power. I invite you to observe what comes up and let it be okay. Tap into the part of you that is fearless, then take a deep breath and re-assess. You are totally capable of accomplishing any and every desire that exists in your heart. This virtual training is jam-packed with exceptional content and tools that will indeed set you up for success. I believe that if you begin the virtual training with an open heart and release all judgment, then you will absolutely find great benefit in the materials. Because you get access to all of the juicy content and proven strategies upfront, I'm unable to issue a full or partial refund on any or all used or unused virtual training materials. I have another question that's not mentioned above. Who can I contact before I purchase the virtual training to ask it? You can email Sarah Aderson at Info [at] ExpandYourHeart [dot] Org if you have any additional questions or concerns.